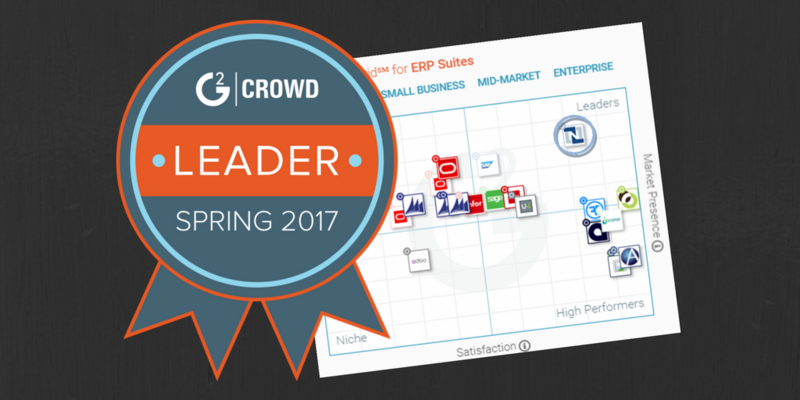 As of the end of first quarter of 2017, NetSuite ERP has topped the G2 Crowd Grid℠ for ERP Suites, a crowd-sourced ranking of the leading ERP Suites making it the top "Leader" in its category. As mentioned in their website, the best ERP Suites Software are determined by customer satisfaction, which are based on user reviews, as well as their scale, which is based on their market share, vendor size, and social impact. A total of 126 ERP suite platforms competed based on the criteria. 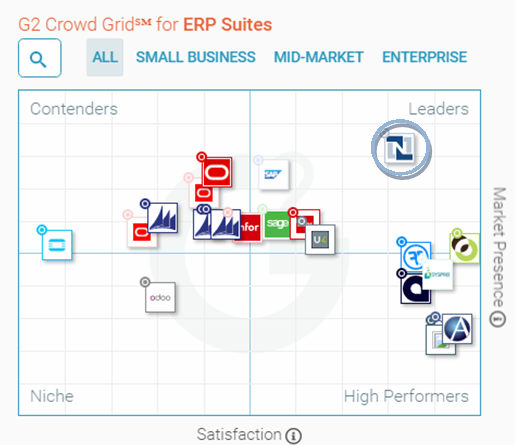 Among all, NetSuite ERP garnered the highest G2 Score at 87 points. Following NetSuite is Intacct, FinancialForce and SYSPRO which garnered 78, 70 and 70 points, respectively. The G2 Score is calculated by combining the satisfaction rating and market presence score. NetSuite's score was also calculated based on 90 independent reviews. With both high ratings in satisfaction and market presence, NetSuite was marked as the "leader among leaders". 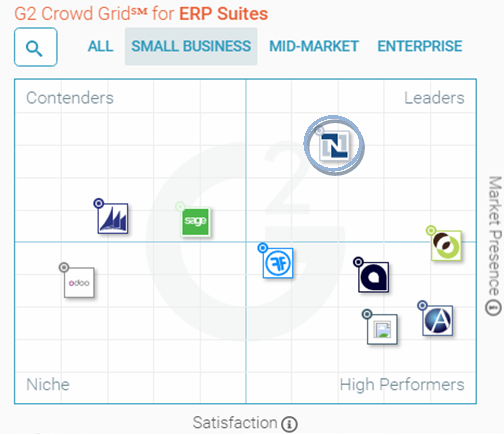 As you can see in the grid below, NetSuite is the sole solution that had both a high market presence and market satisfaction, overall. According to G2 Crowd, Leaders have garnered high ratings from G2 Crowd users and have substantial scale, market share, and international presence and service resources. Leaders include: NetSuite ERP, Intacct, FinancialForce Accounting, SAP ERP, Sage 100c, Infor ERP and Unit4 Business World. Meanwhile, those named High Performers are highly rated by their users, but don't have the same market share and scale of the Leaders. High Performers named by G2 Crowd include: Officebooks, Acumatica, AllProWebTools, and SYSPRO. Platforms to consider as "Contenders" have significant Market Presence and resources, but have received below average user satisfaction ratings or have not yet received enough reviews to validate them. Contenders named by G2 Crowd include: Infor CloudSuite Industrial, JD Edwards EnterpriseOne, Microsoft Dynamics NAV, Oracle E-Business Suite, Epicor ERP, Microsoft Dynamics GP, Microsoft Dynamics 365 for Operations, and PeopleSoft. Finally, there are also Niche solutions which don't have the Market Presence of the Leaders. They may have been rated positively on customer Satisfaction, but have not yet received enough reviews to validate them. Only Odoo was named in this category. Among Small Businesses, NetSuite ERP still leads in both market presence and customer satisfaction with a G2 Score of 79 based on 32 reviews. Trailing NetSuite is Intacct, Acumatica and AllProWebTools at 74, 61 and 60 points. G2 Crowd nominated Intacct and NetSuite ERP as Leaders for ERP Suites in the Small Businesses segment. Meanwhile, High Performers, which are highly rated by their users, but without the same comparable market share and scale include: Officebooks, Acumatica, FinancialForce Accounting, and AllProWebTools. Contenders include: Sage 100c and Microsoft Dynamics GP while Odoo was named as Niche products. 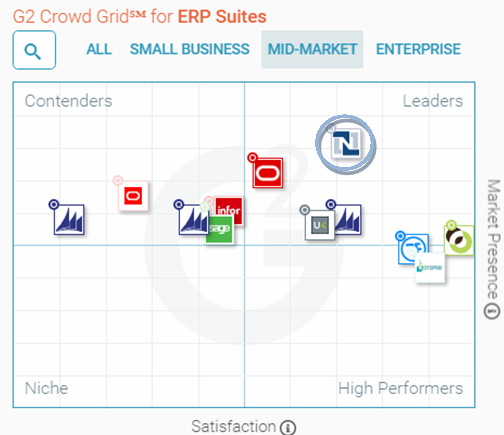 NetSuite also led in both market presence and user satisfaction for the Mid-Market ERP Suite segment. NetSuite ERP gained a G2 Score of 80 followed by Intacct, FinancialForce Accounting and SYSPRO at 78, 70 and 69 points. However, NetSuite hasn't gained a position in the Enterprise ERP Suite segment. This area is currently dominated by a handful of platforms and led by SAP ERP with a G2 Score of 80 followed by Infor ERP, Intacct and Oracle E-Business Suite at 79, 71 and 59 points, respectively. FREE demo of NetSuite ERP!